The Best Cyber Security blogs from thousands of top Cyber Security blogs in our index using search and social metrics. Data will be refreshed once a week. Also check out Cyber Security Podcasts and Cyber Security Youtube Channels list for Top videos on Cyber Security. 2.60 Connected - Official Blog of Connection, Inc.
About Blog WeLiveSecurity is an IT security site covering the latest news, research, cyber threats and malware discoveries, with insights from ESET experts. Facebook fans 1,940,222. Twitter followers 3,973. Santa Clara, CA About Blog McAfee is one of the world’s leading independent cyber security companies. Inspired by the power of working together, it creates business and consumer solutions that make the world a safer place. Facebook fans 897,057. Twitter followers 106,368. About Blog Naked Security is Sophos's threat news room. We'll warn you about all kinds of bad computer threats, including the latest Facebook scams and rogue apps. Facebook fans 265,873. Twitter followers 51,039. India About Blog Simplify the way you secure your computer. We Protect millions of users and business networks worldwide from all kinds of Internet threats. Facebook fans 206,479. Twitter followers 96,732. Facebook fans 22,153. Twitter followers 168,174. Framingham, Mass. About Blog CSO, from IDG, provides news, analysis and research on a range of security and risk management topics. Areas of focus include information security, data protection, social media security, social engineering, security awareness, business continuity and more. Facebook fans 16,290. Twitter followers 48,627. Mountain View, California About Blog Our security research centers around the world provide unparalleled analysis of and protection from malware, security risks, vulnerabilities, and spam. Facebook fans 81,256. Twitter followers 154,754. Napoli, Italy About Blog This website is dedicated to everything digital forensics, from hacking to cybersecurity. Every day, readers can get new information on the digital forensics front – often with headlines pulled straight from top-tier media. This site also touts a large database of research on cyber threats, from international security spending to the most damaging cyber attacks of the year. Facebook fans 15,255. Twitter followers 18,567. Boston, Mass. About Blog CIO is the place where you find news, information technology articles, insight and analysis on major data breaches and online threats. Covering multiple aspects of world wide web, it provides in-depth, content rich information for IT professionals and normal users. Facebook fans 58,844. Twitter followers 188,179. US About Blog PayPal US mission is to give buyers and sellers a safe, secure way to pay and do business. Facebook fans 5,926,146. Twitter followers 562,995. London About Blog Known for its quality articles on world news, Guardian offers a section dedicated to information security for companies and individuals. To stay up-to-date with the latest articles and news on cyber security, make sure you follow this site. Facebook fans 8,078,113. Twitter followers 7,478,234. New York, NY About Blog The latest news on digital security from forbes. Facebook fans 3,601,596. Twitter followers 10,941,223. About Blog The latest updates on security from Cisco. Cisco (NASDAQ: CSCO) is the worldwide technology leader that has been making the Internet work since 1984. Facebook fans 337,923. Twitter followers 372,409. USA | UK | Asia | Australia About Blog The Zero Day security blog is important for all the people part of the IT industry. Follow it for staying on top of the latest in software/hardware security research, vulnerabilities, threats and computer attacks. Facebook fans 269,284. Twitter followers 433,130. USA | UK | Australia | Asia About Blog TechRepublic provides large resources for the online industry, such as blog articles, forums, technical papers and security data. All the valuable information available helps IT professionals and technology leaders to come with the best decisions on their business processes. Facebook fans 988,378. Twitter followers 204,527. San Francisco, CA About Blog TrustArc, the new TRUSTe, powers privacy compliance and risk management with integrated technology, consulting and privacy certification solutions. Facebook fans 62,617. Twitter followers 13,214. Worldwide About Blog Acunetix is a Web Vulnerability Scanner, that automates web application security testing and audits your web applications by checking for exploitable hacking vulnerabilities. Keep up with articles, tips and general news on web security. Facebook fans 17,082. Twitter followers 5,922. Worldwide About Blog Welcome to the SANS Tip of the Day blog. Each day we post a new tip that focuses on and explains a specific topic and actionable steps people can take to protect themselves, their family and their organization. Facebook fans 15,513. Twitter followers 101,826. Broomfield, Colorado About Blog Internet Security Threat Updates & Insights. Webroot provides real-time protection for PCs and Macs against viruses, malware, phishing attacks and identity theft. Our unique, smart cloud technology scans fast and secures your online identity and financial information without interrupting or slowing down your online experience. Facebook fans 94,247. Twitter followers 58,699. London, England About Blog Techworld is an industry leader in business technology publishing, published by IDG (International Data Group). The Security section is dedicated to analyzing the latest malware threats and zero-day exploits. You can find here other important topics and subjects, such as security articles, how-to documents and software reviews. Facebook fans 14,023. Twitter followers 16,155. San Carlos, CA About Blog News and information about internet security, online threats and safe web practices. ZoneAlarm is a world leader in firewall & antivirus software, and mobile security. Facebook fans 1,099,290. Twitter followers 5,762. Wakefield, MA About Blog Insights, information and practical resources to help your organization protect payment data. Facebook fans n/a. Twitter followers 12,172. About Blog Building effective virtual government requires new ideas, innovative thinking and hard work. From cybersecurity to cloud computing to mobile devices, Dan Lohrmann will discuss what's hot and what works in the world of government technology. Facebook fans 9,859. Twitter followers 25,071. About Blog We are online security blog and a forum, updated daily with the latest PC security news and ransomware and viruses removal guides . A team of researchers examines malware thoroughly to provide the latest, up-to-date information on malware removal. The team publishes removal articles to help users remove viruses and restore files encrypted by ransomware. Facebook fans 2,518. Twitter followers 1,185. Copenhagen About Blog The Heimdal Security blog – your go-to source for action-ready cyber security advice! Packed with free educational resources that anyone can apply. Facebook fans 1,463. Twitter followers 3,120. McKinney, TX About Blog Find comprehensive articles about Information Security on our blog. Down-to-earth tips on adopting infosecurity strategies and tools to help you reinforce your company's protection in the hazardous cyber reality. Facebook fans 413. Twitter followers 352. Global About Blog Daily information security news with a focus on enterprise security. Worldwide About Blog IT Governance is a leading global provider of IT governance, risk management and compliance solutions, with a special focus on cyber resilience, data protection, PCI DSS, ISO 27001 & cyber security. In an increasingly punitive and privacy-focused business environment, we are committed to helping businesses protect themselves & their customers from the perpetually evolving range of cyber threats. Facebook fans 2,199. Twitter followers 19,015. Worldwide About Blog Seqrite is Quick Heal's Enterprise Security brand defined by innovation and simplicity. Our solutions are a combination of intelligence, analysis of applications and state-of-the-art technology, and are designed to provide better protection for our customers. Facebook fans 1,026. Twitter followers 17,776. Washington, USA About Blog Our company mission to deliver the first class software to secure the sensitive data across the world. We are convinced that the best data security software has to be user-friendly and easy-to-use. New York, USA About Blog Connecting industry leaders with actionable and useful knowledge on information technology. Facebook fans 9. Twitter followers 938. Redwood City, CA About Blog Read the latest cyber security news from Lastline including malware research & analysis from the Lastline Labs research center. About Blog HackingVision provides news, tutorials, hacking tools, Linux support, General Computer, Cyber Security and improving awareness online. Singapore About Blog By this platform, REVE Antivirus wants to make your digital life more secure, so that you can use your PC, browse the internet and perform online transactions without any worry. We are committed to keep you updated with the latest online threats and post security tips that will help you keep your PC free from viruses, spams and malicious elements. Facebook fans 977. Twitter followers 2,003. About Blog Learn about how to protect your information and online presence. Get the security awareness tips, technology news and update your knowledge with us. Facebook fans 120. Twitter followers 1,756. About Blog The IS Decisions Blog covers Enterprise Network Security for Windows Server and Active Directory. Commentary and expertise is provided from our staff, our partners and our clients on some of the biggest security risks that organizations face today. Facebook fans 202. Twitter followers 1,697. About Blog Haxf4rall is a collective, a good starting point and provides a variety of quality material for cyber security professionals. To know more on this, subscribe with us. Facebook fans 10,546. Twitter followers 1,333. Rhode Island About Blog The Security Weekly mission is to provide free content within the subject matter of IT security news, vulnerabilities, hacking, and research. We strive to use new technologies to reach a wider audience across the globe to teach people how to grow, learn, and be security ninjas. Facebook fans 8,680. Twitter followers 45,629. About Blog Security Innovation is a global provider of application security & cryptography solutions. The company helps build internal security expertise, reduce application risk, and improve the process by which applications are built. Facebook fans 346. Twitter followers 1,636. London, UK About Blog Keep up with IT security news for channel, value added resellers / VAR and IT security / infosec professionals. Facebook fans 96. Twitter followers 579. About Blog Aghiath Chbib is a Cyber Security, Fintech, Blockchain and Digital Forensics Business Leader, Director / CEO. Facebook fans 92. Twitter followers 249. About Blog CloudMask ensures the privacy of user data, by applying encryption methods at the end-user device, without requiring any changes to the Cloud application. Facebook fans 1,710. Twitter followers 8,118. About Blog Welcome to CyberInfoVeritas (The Truth About Cybersecurity). I started in the IT field during the 1990’s and later transitioned into Cybersecurity. I spent most of my working years in management positions at Fortune 500 companies and owning my own businesses. Now, I share on this blog all the tips I’ve learned during my time in the IT and Cybersecurity fields. About Blog In this Cyber World we are all at risk every minute due to the increasing crime happening due to technology. Every day there is a new breach and a new crime. We provide you all the latest posts and updates on our simple website to keep you updated about all the things happening in the internet world. Brisbane, Queensland About Blog Entersoft is a leading application security provider helping businesses across fintech and blockchain technology, secure their applications, through future-ready solutions that help keep up with the changing technology landscape. Our strengths lie in assessing security risks, monitoring for threats and safeguarding applications against compliance issues as well as the latest threats. Facebook fans 3,074. Twitter followers 295. 60. Connected - Official Blog of Connection, Inc.
Merrimack, NH About Blog Blog by Stephen Nardone. Stephen is Practice Director of Security and Mobility at Connection with over 34 years of experience in both the government side and the commercial side of the security business. New York, NY About Blog Security analysts are always looking for ways to speed up the investigation process. With alerts streaming into the SOC continuously saving a minute here and there can make a big difference. Here at Siemplify we are keenly aware of this desire to make investigations faster and have developed a flexible platform designed to do just. Facebook fans 302. Twitter followers 2,453. About Blog The world's most comprehensive information source about cybersecurity companies, products, services and investors. Facebook fans 75. Twitter followers 8,773. Washington, DC About Blog Working together to educate and advise the public and private sectors on today's cybersecurity issues and needs. Facebook fans 1,823. Twitter followers 373. Sunnyvale, CA About Blog A perspective on Security, Compliance and the Cloud. Proofpoint protects people, data, and brands across email, social, and mobile channels. Facebook fans 2,691. Twitter followers 20,549. Texas, USA About Blog WeSecureApp is helping organizations in minimising the threat landscape which gets inherited with industry and business domain. Having attained industry expertise, WeSecureApp addresses the challenges with a thoughtful and pragmatic approach with the use of unique technological and managed solutions that are designed and developed internally. Facebook fans 861. Twitter followers n/a. Israel About Blog SecBI detects, investigates and responds to full scope incidents so you can stop chasing anomalies, and alerts and focus on what matters, securing your network. Facebook fans 115. Twitter followers 1,069. Nigeria About Blog The SafeOnline guide is an actionable guide to educate citizen groups on simple steps to protect their privacy online, to secure the intergrity of their web properties and to respond in the event of malicious attacks. Find out ways to secure yourself against perils that come with being connected to the global community. Maryland, USA About Blog The COMPASS cyber security blog showcases our wide range of expertise and gives our readers valuable tips for securing their organizations’ data. Facebook fans 131. Twitter followers 38. Minneapolis, MN About Blog Are you a 1 or a 0? Security News and Topics That You Can Understand. Another random voice in the chorus of the cyber-elite. The goal is to entertain and be different from the 1,000 of other re-hased, sponsored filled, un-personal sites out there. If you keep reading you might learn something by accident. Facebook fans 42. Twitter followers 728. NY | DC | Silicon Valley | UK About Blog With GRA Quantum, you gain the foresight and expertise of an extraordinary cybersecurity services firm you can trust with today’s security and tomorrow’s reputation. Facebook fans 757. Twitter followers 637. Seattle, WA About Blog Pulitzer-winning journalist and web producer Byron V. Acohido is the founder and executive editor of Last Watchdog, a pioneering security webzine. LW delivers analysis, news videos and guest essays of and for the global cybersecurity community. The content you will find here is uniformly comprehensive, balanced, accurate and fair. Facebook fans n/a. Twitter followers 8,673. Mumbai, India About Blog K-onSecurity is Cyber Security Online platform in which Our goal is to collect the News, Information and Resources in the field of Cyber Security from different platforms and provide it all here. Facebook fans 59. Twitter followers 102. About Blog Privacy Ref provides privacy consulting services that allow you to create, refine. or supplement your practices to customer, employee, and corporate data. About Blog This blog is all about learning Cyber & Information Security & IT. For more updates on this, follow us. New York, USA About Blog The Technolab offers a daily news digest of all the best breaking IT security news stories! We also update Computers Knowledge! Rather than you having to crawl all over the Internet to find out what's cooking, you can quickly get everything you need from this Technolab. Facebook fans 8. Twitter followers 5. About Blog This page will give you Update on Cybersecurity issues around the world. Facebook fans 574. Twitter followers 297. About Blog Today Cyber Security plays a paramount role in global security. On this blog, the CEO of Paramount Defenses shares rare insights on issues related to Cyber Security, including the World's Top Cyber Security Risk, Advanced Persistent Threats (APT), Cyber Warfare, Corporate Espionage, Insider Threats and other topics. About Blog SANS Software Security provides training, certification, research and community initiatives that help IT specialists build secure applications. Facebook fans 12,987. Twitter followers 7,988. Gaithersburg, Maryland About Blog This blog, brought to us from The National Institute of Standards and Technologys Hollings Manufacturing Extension Partnership, is sectioned into eight distinct sub-categories:Industrial Manufacturing, Advanced manufacturing, Data & Trends, Export, Finance, Innovation, Sustainability, Competitiveness,Workforce. Facebook fans 67,099. Twitter followers 49,653. Facebook fans n/a. Twitter followers 271,785. About - We look at Cyber Security from a UK perspective, although given cyber crime tends to global in nature we cover and learn the lessons from security issues, industry reports, latest trends and hacking incidents from around the world as well. About - A UK view on Cyber, Information & IT Security by Security Expert Dave Whitelegg. Providing advice and explaining security for everyone, and also contemplating advanced themes and future trends in security. With a focus on all the latest developments & issues within the UK Information Security space such as Hacking, DDoS, Malware, Identity Theft, Data Protection (GDPR) and regulatory compliance like PCI DSS & ISO27001:2013, all will be explained in an easy to understand way. About - If your computer, and the data on it, is important to you - keep yourself informed about the latest security news by following Graham Cluley Security blog from veteran anti-virus expert Graham Cluley. About - IT Governance is a leading global provider of IT governance, risk management and compliance solutions, with a special focus on cyber resilience, data protection, PCI DSS, ISO 27001 and cyber security. 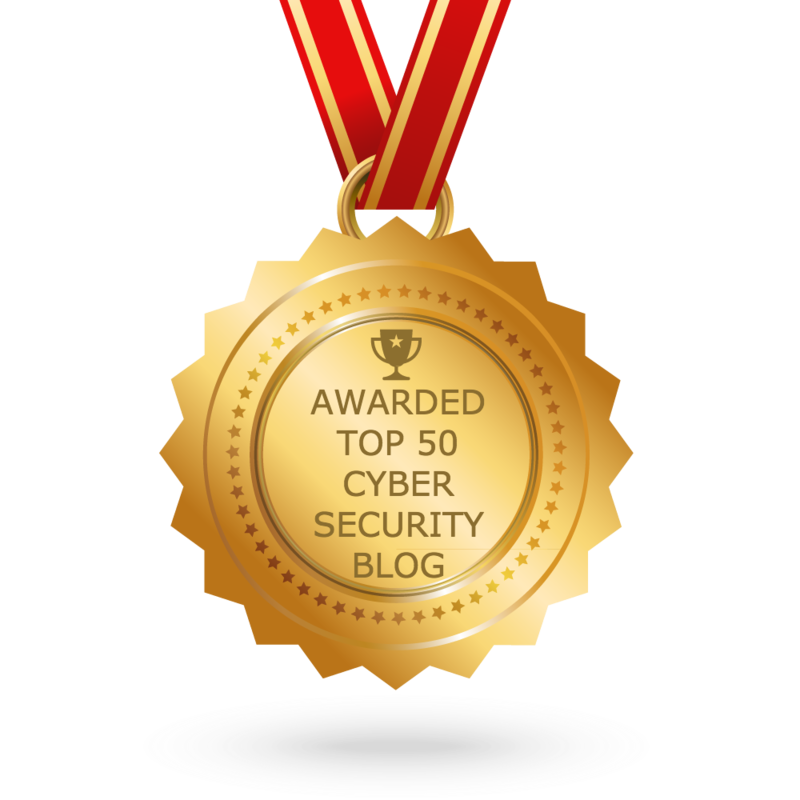 CONGRATULATIONS to every blogger that has made this Top Cyber Security blogs list! This is the most comprehensive list of best Cyber Security blogs on the internet and I’m honoured to have you as part of this! I personally give you a high-five and want to thank you for your contribution to this world.